That reminds me of an old painting I've seen of Darth Vader when he was still in the concept stage. Yay! A Darktrooper. Awesome work, Jeff. I know the image you mean, but this looks like a Dark Trooper to me, from the first Dark Forces game. What about a space trooper? Note the 'dark' in the URL. Hence, Darktrooper. Heck...I thought you guys would have picked up on "moldy". If you mass-produced and sold these I would just...die. Darktroopers own. When I first saw Moldy, I immediately thought Moldy=Moldy Crow==Dark Forces=Dark Trooper. If you play Battlefrot, you know the Darktrooper. And I LOVE this one! Nice work, Jeff! I love it! Yes, swamp troopers were in Jedi Knight 2: Jedi Outcast, stationed on the fourth moon of Yavin. But they look more like scouts, if I remember correctly. Cool, that looks really slick, will you be mass producing these? will you be mass producing these? Please please please please pleaseeeeeeeee, Jeff? I don't know or care what a "darktrooper" is, but the helmet does remind me of the concept vader helmet. Very samurai-y. Hopefully this'll be painted gloss black, right? 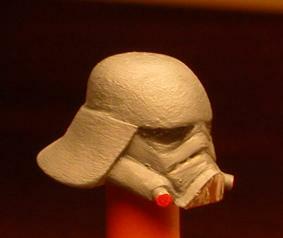 Well to remain true to the dark trooper it should be dark grey I believe. Canon has nothing to do with looks or appearance, it has to do with being in the movies or not. Well it may be more canon than not, if you get me. So one might be more official than the other, in terms of EU. I must admit, when Jeff sent me pics of this the other day, that is what I thought it was going to be. Now seeing it painted it is obviously A Darktrooper. Adventures in customs ebay and my B-shelf is here! are you planning on making epi 3 weapons? just don't see any real need for it. blaster with the scope cut off. enough(for me)to warrent the cost. I'm really in anticipation of what you will do with the darktrooper! Surprise us! So will you be mass produceing these? "it's too close to infringement" heading as far as I'm concerned. ABS resin casts from it(like Robert Martin), I'd try that route.